Temporal and spatial variability in environmental forcing and human actions (Area 1) interact with the geomorphic characteristics of the landscape (e.g. soil type, elevation, drainage patterns) to produce gradients in salinity, nutrients, inundation, and larval dispersal. These in turn produce variations in habitat, biogeochemical processes, primary production, community composition, decomposition, and disturbance across the landscape. To understand these relationships, we need a long-term perspective on the temporal and spatial patterns of biotic and abiotic variables within the domain and how they relate to environmental gradients. We accomplish this through our core monitoring program (a continuation of efforts in GCE-II), with the addition of remote sensing and hydrodynamic modeling. Our goals are to describe temporal and spatial variability in physical (stratification strength, estuarine salt intrusion length, residence time), chemical (salinity, nutrient concentration and speciation, organic matter lability), geological (accretion) and biological (organism abundance and productivity, microbial processes) properties within the domain and to evaluate how they are affected by variations in river inflow and other boundary conditions. We collect data documenting key ecosystem variables within the GCE domain. Major activities in this area consists of A) field monitoring of water and marsh attributes at our core monitoring sites, B) remote sensing of productivity and habitat shifts, and C) hydrodynamic modeling of water and salt transport. Our core monitoring program addresses the five LTER core areas and is conducted at 10 sites distributed throughout our domain: 3 along an onshore-offshore gradient in each Sound, and one in the Duplin River. We also collect water column samples at an offshore site (AL-02) to characterize the Altamaha River plume as it mixes with the ocean. We deploy sondes that monitor salinity, temperature, and pressure continuously at 9 of our sites and obtain vertical CTD profiles at all 11 sites during our mini-cruises, in which we collect discrete water samples to measure nutrients, chlorophyll, and suspended sediment. We monitor soil accretion, accumulation, compaction and decomposition; disturbance to plant communities; and plant and animal biomass, densities, and community composition in the marsh associated with each site. In GCE-III we also added some new components to the monitoring program, including: 1) barnacle recruitment in marshes to explore variation in larval recruitment, 2) mixed plant community (Zizaniopsis/Spartina cynosuroides; S. cynosuroides/S. alterniflora) plots to characterize vegetation shifts between fresh, brackish and salt marsh habitats, 3) mixed plant community (Borrichia/Juncus) plots, which will augment existing plots (Juncus/S. alterniflora mixtures) to characterize vegetation shifts in the high marsh, 4) a new monitoring site in the tidal forest (GCE 11, instrumented in the same manner as our other stations with a moored sonde in the main channel and permanent vegetation, marsh plots, and sediment elevation tables) to assess the potential for salt water intrusion into the tidal fresh forest habitat, 5) a sonde that measures DO and pH by the flux tower. We also monitor above and below-ground plant biomass monthly in stands of short, medium and tall Spartina to provide higher frequency data to support plant modeling and interpretation of flux tower measurements, and monitor the growth of headward-eroding creeks annually to document geomorphic change and provide context for creek growth experiments. In the fresh/brackish marsh (Area 3B) we will add quarterly transects in the Altamaha to document the extent of salinity intrusion as a function of river flow. In the high marsh (Area 3C) we will continue to me asure water level and salinity in groundwater wells at our instrumented hammocks (2 more years). In Area 4 we will support the hydrodynamic model by measuring net transport between the Sounds and the shelf. We will also measure radon concentrations in the Duplin as a way to constrain groundwater input. We will support our projections of habitat provisioning by: 1) monitoring blue crab abundance in a creek in the Duplin River (with pop-up nets) to document temporal patterns in marsh access by an important consumer (weekly for 2 y, monthly thereafter; Area 3A), and 2) continuing weekly measurements of ammonium oxidizing bacteria to better characterize their seasonal dynamics in relation to environmental factors such as temperature (2 y). Finally, we will support the development of C budgets by: 1) characterizing DOM composition and predominant sources in water samples collected at core monitoring sites, 2) measuring DIC, alkalinity and pH in the creek adjacent to the flux tower (quarterly for 2 y), and in the Duplin River (monthly for 2 y) and 3) measuring radioisotopes of cores (210 Pb, 137 Cs, 7 Be) in combination with sediment plates to determine deposition (transitory settlement) and accumulation (permanent storage) in each of our major habitat types. We have used LIDAR and hyperspectral imaging to develop a detailed digital elevation model and vegetation map of the Duplin River marshes, which are guiding site selection and Duplin-scale research (Area 3A) and will be useful as a baseline for evaluating future change. In GCE-III we added several new remote sensing applications to extend the temporal and spatial scales of our research. 1) We are collecting high-resolution color aerial photographs of Altamaha Sound (Area 3B) and the Duplin River (Areas 3A, 3C) at low tide each fall. Images of the Altamaha will be used to delineate the major intertidal habitats along the estuary and evaluate shifts over time and space, and to document disturbance and recovery. Imagery of the Duplin will be used to evaluate disturbance, changes in creek geomorphology (particularly headward erosion of creeks) and changes in the high marsh border. 2) We will obtain annual Landsat multispectral images centered in monospecific stands of Spartina, Zizaniopsis, and Juncus (Areas 3A, B, C). These images will be analyzed for variability in plant biomass over time, allowing us to extend our field monitoring record back by 3 decades and test whether correlations between external drivers and plant productivity in permanent plots can be scaled to new and larger sites. 3) We will obtain multispectral MODIS data (8-day composite averages) for areas centered on the flux tower (Area 3A) to evaluate changes in biomass compared to those derived from flux tower sensors, with the goal of scaling our observations of marsh-atmosphere CO2 exchange. Where possible, this will be augmented with WorldView-2 satellite imagery to provide higher resolution information. We are developing high-resolution, three-dimensional, numerical hydrodynamic models of the Duplin River and the larger GCE domain as tools that will provide critical information about water circulation, the transport of materials by advection and dispersion, and residence time. The models will also provide predictions of salinity and inundation patterns across the landscape that are essential for addressing our central hypotheses regarding how these might be altered under different conditions (Area 4). We are using the Finite Volume Coastal Ocean Model (FVCOM) to develop a fine-scale model for the Duplin River, which will be nested in a larger GCE domain model. FVCOM, which has been used successfully in many estuaries, has unstructured grids that make it useful for resolving complex estuarine geometry and bathymetry. It also includes a wet/dry element analysis algorithm to model the moving surface boundary required to simulate the flooding/drying process. We will also explore the influence of the tidal marsh vegetation canopy on the flow and related frictional drag force and on the turbulence and related production and dissipation of kinetic energy by introducing parameterizations that are dependent on plant properties such as stem diameter and density. Description: The GCE core monitoring program in the water column consists of continuous measurements of salinity, temperature and pressure at 9 sites, and quarterly or monthly CTD profiles and measurements of nutrients, chlorophyll and suspended sediment at 11 sites (yr 1-6). This will be augmented to include Secchi depth, pH, DIC and total alkalinity (starting yr 1), an additional sonde in the Duplin (installed yr 2), and documenting salinity intrusion in the Altamaha (starting yr 1). Description: We will perform quarterly transects in the Altamaha to document the extent of salinity intrusion as a function of river flow for 3 years, with opportunistic sampling during extreme events thereafter. In the high marsh we will continue to measure water level and salinity in groundwater wells at our instrumented hammocks. Description: We have used LIDAR and hyperspectral imaging to develop a detailed digital elevation model and vegetation map of the Duplin River marshes, which are guiding site selection and Duplin-scale research (Area 3a) and will be useful as a baseline for evaluating future change. In GCE-III we will add several new remote sensing applications to extend the temporal and spatial scales of our research. 1) We will collect high-resolution color aerial photographs (georeferenced, 0.5'-scale in 3 color bands) of Altamaha Sound (Area 3b) and the Duplin River (Areas 3a, 3c) at low tide each fall. Images of the Altamaha will be used to delineate the major intertidal habitats along the estuary and evaluate shifts over time and space (Carle 2011), and to document disturbance and recovery (e.g. bare patches due to salt marsh dieback are expected to correlate with drought (Alber et al. 2008). Imagery of the Duplin will be used to evaluate disturbance, changes in creek geomorphology (particularly headward erosion of creeks) and changes in the high marsh border. Description: We will obtain annual Landsat multispectral images (30 x 30 m pixels) centered in monospecific stands of Spartina, Zizaniopsis, and Juncus (Areas 3a, b, c). These images will be analyzed for variability in plant biomass over time, allowing us to extend our field monitoring record back by 3 decades and test whether correlations between external drivers and plant productivity in permanent plots can be scaled to new and larger sites. 3) We will obtain multispectral MODIS data (8-day composite averages) for areas centered on the flux tower (Area 3a) to evaluate changes in biomass compared to those derived from flux tower sensors, with the goal of scaling our observations of marsh-atmosphere CO2 exchange. Where possible, this will be augmented with WorldView-2 satellite imagery to provide higher resolution information. Description: We are developing high-resolution, three-dimensional, numerical hydrodynamic models of the Duplin River and the larger GCE domain as tools that will provide critical information about water circulation, the transport of materials by advection and dispersion, and residence time. The models will also provide predictions of salinity and inundation patterns across the landscape that are essential for addressing our central hypotheses regarding how these might be altered under different conditions (Area 4). We are using the Finite Volume Coastal Ocean Model (FVCOM; Chen et al. 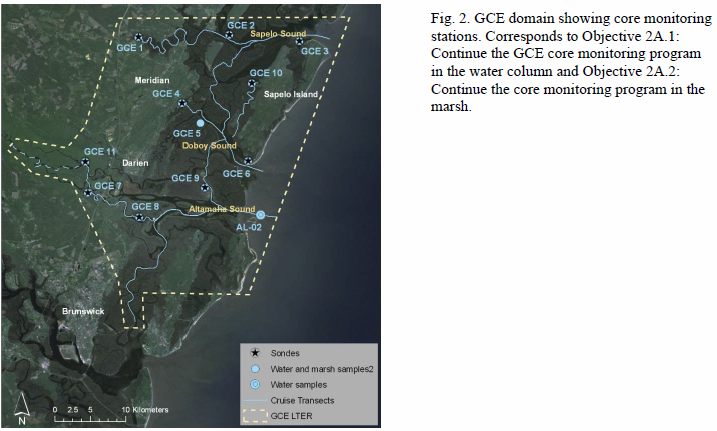 2006, 2007, 2008) to develop a fine-scale model for the Duplin River, which will be nested in a larger GCE domain model (discussed below). FVCOM, which has been used successfully in many estuaries, has unstructured grids that make it useful for resolving complex estuarine geometry and bathymetry. It also includes a wet/dry element analysis algorithm to model the moving surface boundary required to simulate the flooding/drying process (Chen et al. 2008). We will also explore the influence of the tidal marsh vegetation canopy on the flow and related frictional drag force and on the turbulence and related production and dissipation of kinetic energy by introducing parameterizations that are dependent on plant properties such as stem diameter and density (Temmerman et al. 2005; Fagherazzi et al. in press). Description: We will deploy ADCPs at the mouths of the Sounds (Area 1) to calibrate and validate exchange with the coastal ocean, and data from GCE sondes and CTD profiles will be used to calibrate and validate salinity and tidal height. The model will be forced with freshwater inflow from the Altamaha River, wind at Gray's Reef, and precipitation and heat flux from our weather station at Marsh Landing (Fig. 1). Bathymetry and surface topography will be from the NOAA NGDC Coastal Relief Model, augmented by water depths measured during field campaigns. The model domain will cover the entire Altamaha-Doboy-Sapelo estuarine complex to the 2-m elevation mark (relative to MSL) and out to the adjacent coastal ocean up to the 30-m isobath. The model will be initially implemented with a horizontal resolution of ~10-40 m in tidal creeks, 50-100 m over salt marshes, and 0.15-2.5 km in the main water channels and near the open boundary over the shelf (Chen et al. 2008; Ralston et al. 2010a, b; Zhao et al. 2010). The vertical resolution will be adjusted to capture the range of observed stratification. Salinity distribution results for the Altamaha estuary will be compared with those from an existing empirical model (Squeezebox; Sheldon & Alber 2002, 2005), which produces 1-D, tidally-averaged box models that can be used to predict salinity distribution and transit times for different river flows. Activities: We maintain sondes at 9 GCE sites (Fig. 2). We also take CTD measurements and collect and processes water samples according to the schedule in Table 1. Results: Di Iorio and Castelao (2013) summarized salinity, wind, sea level and river discharge data from 2002 to 2012 and compared results to an idealized model of the GCE domain. They found that system wide freshening is dominated by river forcing, and that changes in salinity due to wind forcing causes a different response in the Altamaha River than in Doboy or Sapelo Sound. Model results indicate that the Intracoastal Waterway and the complex network of channels that connects the sounds play a dominant role in water exchange between the adjacent estuaries. Plans: We have not yet enhanced our monitoring program due to a combination of factors: our Secchi depth order was delayed because of difficulty locating a model that could be deployed by hand yet would still be heavy enough to withstand strong currents; the pH, DIC and alkalinity sampling was postponed because the Cai lab moved from UGA to U Delaware and a senior researcher passed away; our portable CTD to be used for salinity was on loan. These issues will be addressed in the coming year. Activities: We maintain sondes at 9 GCE sites (Fig. 2 ). We also take CTD measurements and water samples according to the schedule in Table 1. This past year we added measurements of pH, DIC and alkalinity, and began documenting salinity intrusion into the Altamaha. Plans: We received supplemental funding to purchase a state-of-the-art SeapHOx instrument, which will provide continuous measures of pH that can be used to evaluate ocean acidification. The instrument also has oxygen, temperature and salinity sensors, and will be used instead of the sonde that we originally proposed to deploy. The instrument, which is being calibrated, will be installed at the mouth of the Duplin River. The final addition to the core water quality monitoring program (Secchi depth) will also be added this coming year. Activities: We maintain sondes at 9 GCE sites (Activities Fig. 2). We also take CTD measurements and water samples according to the schedule in Table 1. This past year we added a SeapHOx instrument (purchased with supplemental funds), which provides continuous, highly accurate measurements of pH. The instrument is being tested at the mouth of the Duplin River. Results: Although the Altamaha river estuary is slightly stratified during both low and high flow, our initial assessment suggests that upstream saltwater intrusion shifts approximately 15 km seaward during high discharge conditions. Activities: We continue to maintain sondes at 10 GCE sites (Fig. 2). We also take CTD measurements and water samples according to the schedule in Table 1. Results: GCE nutrient data were contributed to a database that is being compiled for use by EPA in support of setting numeric nutrient criteria for coastal waters in GA/SC. Activities: We continue to maintain sondes at 10 GCE sites (Fig. 4). We also take CTD measurements and water samples according to the schedule in Table 1. In March 2017 we increased nutrient sampling to monthly at all GCE sites and added 10 additional sites as part of a GA EPD project to establish numeric nutrient criteria. Results: Continue the core monitoring program in the water column We compiled information on the methodologies, detection limits, and ranges observed in the GCE water quality data to help inform decisions about future nutrient sampling by the State. Activities: We monitor plant productivity and community structure, invertebrate community structure and sediment elevation at each core site (Fig. 2). In 2013 we expanded the monitoring to include additional plant mixtures and barnacle recruitment and replaced a corroded SET. 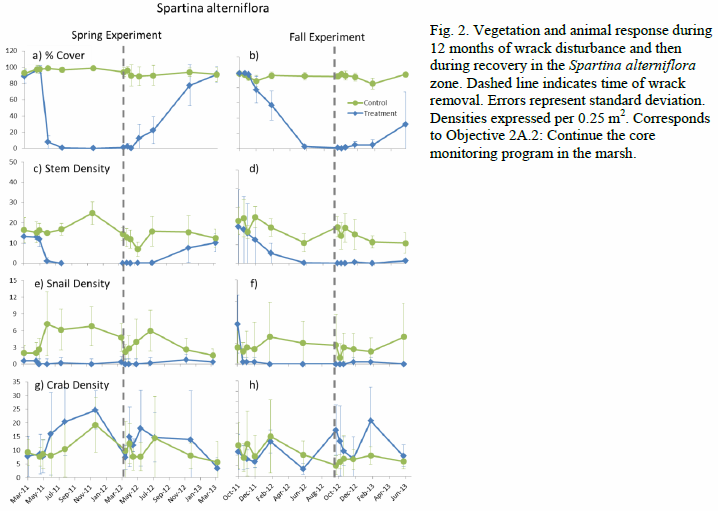 We also continued monitoring recovery from a disturbance experiment in which wrack was added to experimental plots in each of 5 marsh vegetation zones. Results: Analysis of plot biomass data from 2000 to 2011 showed that river discharge was the most important driver of S. alterniflora ANPP at almost all GCE sites, especially in creekbank vegetation (Fig. 1). Increased river discharge reduced water column and consequently porewater salinity, and this was most likely the proximate driver of increased production. In the mid-marsh zone, river discharge and maximum temperature had similar predictive ability. In the wrack manipulation experiment we found that some effects on plant density could be seen in within 1-2 months, and if kept in place for 8 months to a year the wrack killed essentially all of the underlying vegetation (Fig. 2). Plants underneath wrack had reduced chlorophyll concentrations in comparison to plants from control plots, and Spartina alterniflora also had reduced concentrations of DMSP. Loss of plants was accompanied by a reduction in the densities of the periwinkle snail, Littoraria irrorata. Recovery from the effects of wrack disturbance is ongoing, and appears to be following an elevation gradient. After 1 year, plant densities in the three Spartina zones were at least 50% of those in control areas whereas those in the high marsh zones (Juncus and marsh meadow) were less than 5% of controls. Activities: We monitor plants, invertebrates, and sediment elevation at each core site (Fig. 2) as well as plant mixtures and barnacle recruitment at sites established in Yr 1. We also continued monitoring recovery from a wrack disturbance experiment. 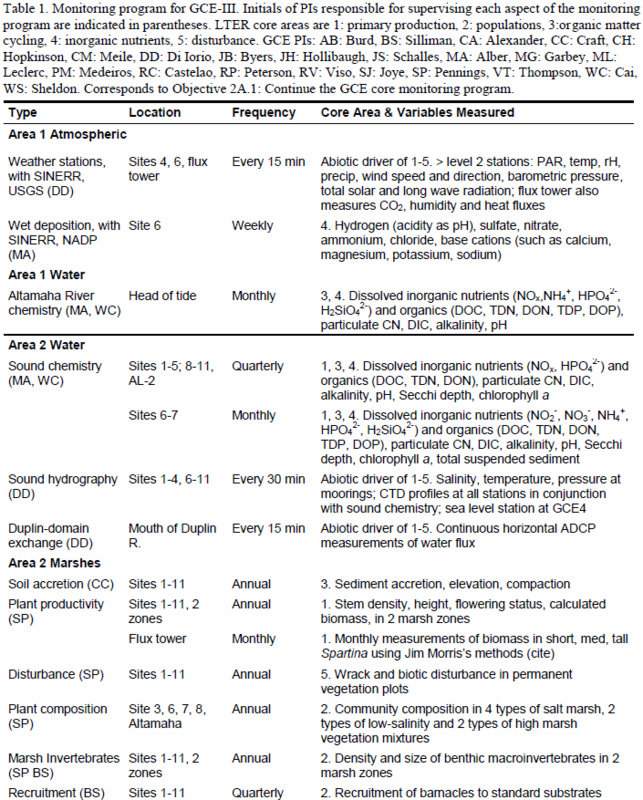 Activities: We monitor plants, invertebrates, and sediment elevation at each core site (Activities Fig. 2) as well as plant mixtures and barnacle recruitment at sites established in Yr 1. We also continued monitoring recovery from a wrack disturbance experiment. Results: An analysis of disturbances observed in our long-term monitoring data shows that different disturbances are important in different habitats. On creekbanks, wrack disturbance is common and reduces plant biomass by ~50%. Creekbanks also slump into the subtidal area, causing total vegetation loss. Neither of these processes is important in the mid-marsh, but snails occasionally are associated with loss of vegetation. A manuscript detailing these results is in preparation. Activities: We monitor plants, invertebrates, and sediment elevation at each core site (Fig. 2) as well as plant mixtures and barnacle recruitment at sites established in Yr 1. We also continue monitoring recovery from a wrack disturbance experiment. Results: Li and Pennings (in press) analyzed disturbances in our long­term monitoring plots. 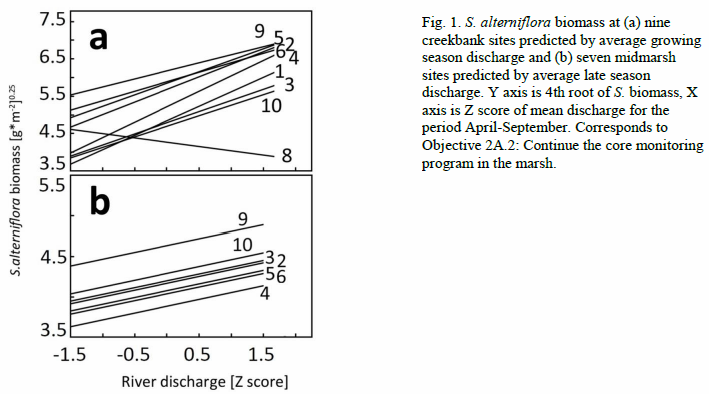 They found that wrack disturbance to creekbank sites is far more common and important than previously realized, that disturbance frequency varies considerably among years, and that it is more common on barrier islands versus interior marshes. Activities: We monitor plants, invertebrates, and sediment elevation at each core site (Fig. 4) as well as plant mixtures and barnacle recruitment at sites established in 2006, and continue monitoring recovery from a wrack disturbance experiment. We have also collected 50cm sediment cores at most of the GCE core monitoring sites for analysis of organic content, carbon, age structure and grain size in order to be able to calculate longterm carbon storage at GCE sites with different plant communities and elevations. Results: Continue the core monitoring program in the marsh Analysis of cores from monitoring sites show sediment accumulation rates vary from 0.1-0.4 cm/y, which suggests that some areas are not keeping up with sea level rise. Activities: We have selected a new core monitoring station on Lewis Island, which is a tidal forest area of the Altamaha River. Plans: We have completed the permit application to install an SET and researched construction and installation of dendrometer bands and litterfall traps for the new site. These will be installed in fall 2013 and winter 2014. Activities: We established a new core monitoring station (2 0.1-ha plots) in a tidal forest area of the Altamaha River (Fig. 2, GCE 11). We are inventorying tree species and have installed dendrometer bands, litterfall traps and an RSET. Results: Over time, saltwater intrusion converts tidal forest to brackish marsh. 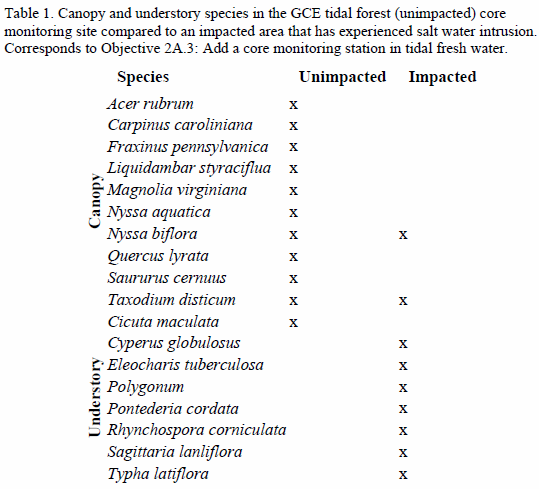 A comparison of the GCE tidal forest site with an area on the Darien River where saltwater intrusion is occurring showed a large reduction in woody biomass and species richness and a concomitant increase in herbaceous species (Table 1). Activities: We are measuring plant productivity at the new core monitoring tidal forest site using dendrometer bands and litterfall traps. We made baseline RSET measurements and will make our first post-baseline measurements in 2016. Results: Annual litterfall based on our first year of data is 572 ± 37 g m-2 . These values are comparable to those in published studies of tidal forests in the southeastern US. Activities: We are continuing to measure plant productivity at the new core monitoring tidal forest site using dendrometer bands and litterfall traps. We have also conducted nutrient (C, N, P) analyses on the litterfall samples and collected soil cores from the levee and plain of the tidal forest site to analyze for nutrient accumulation. Results: Annual litterfall values to date are comparable to published studies of tidal forests in the Southeastern US. Activities: We continue to measure plant productivity at the core monitoring tidal forest site using dendrometer bands and litterfall traps. Results: Add a core monitoring station in tidal fresh water Annual litterfall and stemwood growth values (productivity) and species composition are comparable to published studies of tidal forests in the Southeastern US. Soil accretion rates indicate that most of the nutrient accumulation occurs on the levee, not the interior, of the forest. Activities: We continue to monitor water levels and salinity in wells installed along an upland-to-marsh transect, and installed moisture sensors to investigate rainfall infiltration. We also conducted field excursions in March and June 2013 during which geochemical tracers (radon) and geophysical surveys (subsurface resistivity) were measured to assess groundwater input to the Duplin River. Results: Schutte et al. 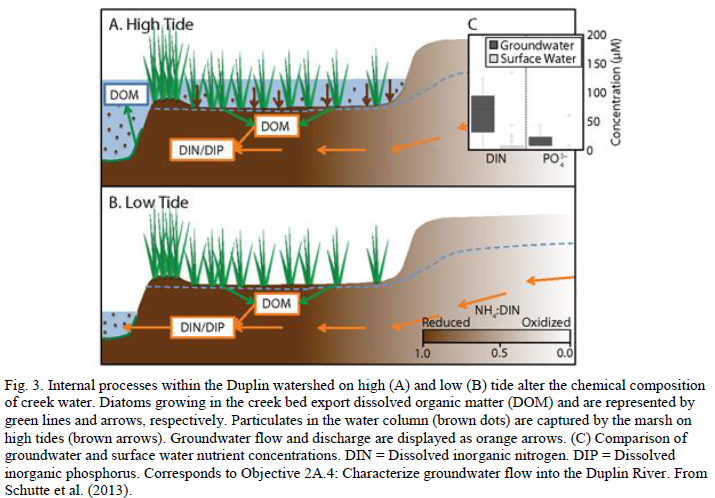 (2013) identified groundwater driven patterns of nutrient concentrations in Duplin surface water, and found higher NH4 and PO4 concentrations on spring than on neap tides (Fig. 3). LeDoux et al. (2013) evaluated the forces that govern groundwater based on GCE data collected along a shallow well transect that runs from a back barrier island over a hammock and into the adjacent marsh. The propagation of pressure in the subsurface was investigated using a one-dimensional model and was found to likely only have a minor effect at the location of the well transect. Density changes were responsible for typically <10% of groundwater flow and the effect was most dominant at the hammock, but the primary forcing function appears to be tidal flushing. Alternate drivers, including precipitation events, are most evident in periods with low tidal forcing. Activities: We have collected sediment cores to constrain groundwater radon end-member activities and sediment characteristics in the Duplin. Results: Based on radon data, Carter (2013) found that the highest groundwater input to the Duplin River occurs in the upper portion of the system (Fig. 2). Activities: In summer 2015 we collected continuous radon and water level data over a period of 3 weeks that is being used to constrain groundwater inputs to the Duplin River. We also collected high resolution electrical resistivity data to examine details of tidal pumping. Results: A manuscript is now in preparation in which we compare groundwater inputs to the Duplin River across multiple years, spanning high/low tides across the spring/neap variations. Activities: In summer 2016 we collected continuous radon and water level data over a period of 3 weeks. We also collected spatial surveys of these parameters during slow surveys covering the entire length of the Duplin River. 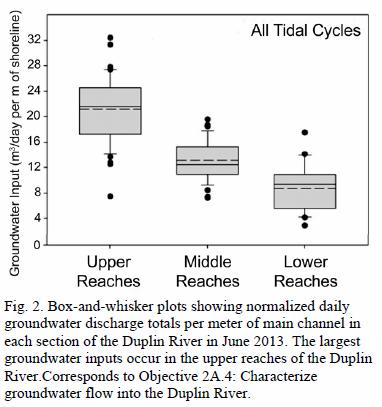 Results: Two manuscripts are in prep that present our methodology and compare groundwater inputs to the Duplin River across multiple years, spanning high/low tides across the spring/neap variations. Activities: In summer 2017 we collected radon timeseries in the Duplin River as well as two representative tidal creeks over a period of 3 weeks. We also refined our analyses of the Rn time series and identified a systematic offset. Results: Characterize groundwater flow into the Duplin R The analysis of contemporary Rn time series allowed us to quantify the magnitude, location and timing of groundwater inputs to the Duplin River (Fig. 3). Activities: We collected weekly water samples at Marsh Landing on Sapelo Island for measurements of AOA, ammonia and nitrite oxidizing bacteria, and DIN. Results: Hollibaugh et al. (2013) documented a consistent summer peak in ammonia-oxidizing archaea that correlates with a peak in DIN, suggesting a temporary uncoupling in the nitrogen cycle. Hollibaugh has received funding from NSF to follow up on the geochemical consequences of these observations. Activities: We continue to collect weekly water samples at Marsh Landing on Sapelo Island for measurements of AOA, ammonia and nitrite oxidizing bacteria, and DIN. Results: Tolar et al. (submitted) analyzed data on the population dynamics of AOA collected since 2008 and found pronounced mid-summer blooms that affect the composition of DIN and coincide with a variety of factors (temperature, dissolved oxygen, pH) associated with the summer increase in net ecosystem heterotrophy. Results: Tolar et al. (2016) found that ammonia oxidation rates were always higher than oxidation rates of urea¬derived N in samples from the GCE, in contrast to those from the Gulf of Alaska. They suggest that the contribution of urea¬derived N to nitrification is minor in temperate coastal waters but may represent a significant portion of the nitrification flux in colder waters. Results: Assess seasonal dynamics of ammonium oxidizing archaea Whitby et al. (2017) evaluated the seasonal cycle of copper speciation in comparison to the annually occurring bloom of Ammonia Oxidizing Archaea (AOA), which require copper for many enzymes. Free copper was in very low concentrations, and they conclude that the AOA are able to access thiolbound copper directly. Activities: We are in the process of selecting sites and obtaining permits to monitor seasonal abundance of blue crabs. Activities: We began weekly monitoring of blue crab abundance in 2 tidal creeks. We are also obtaining data on commercial catch in major channels. Results: Nifong and Silliman (2013) found that blue crabs are a frequent component of the diets of alligators that live in estuaries. The presence of alligators reduced blue crab abundance through predation and influenced blue crab behavior, resulting in reduced foraging. This translated to increased survival of periwinkles and ribbed mussels, and demonstrates the cascading effects of an apex predator through the salt marsh food web. Activities: We ended the blue crab monitoring in the marsh in 2015 because it was too labor intensive to justify the limited data collected. Results: We analyzed long term fishery-independent data collected by the Georgia Department of Natural Resources and found that the number of crabs per trawl was reduced at high salinities. A manuscript is now in preparation. Activities: Altamaha River water was sampled over 3 seasons for DOM characterization. Activities: We collected DOM samples from the GCE domain and analyzed their organic composition with ultrahigh resolution mass spectrometry. Results: Preliminary results indicate that interannual variability in river discharge plays a dominant role in controlling DOM composition variability in the system. During drought conditions, the influence of marsh-derived organic matter imprints a clear signature in the estuarine DOM. Activities: We collected DOM samples from the GCE domain (Altamaha River, Doboy and Sapelo Sounds) and analyzed their organic composition using ultrahigh resolution mass spectrometry. Dark incubations spanning from 24 hours to 70 days were conducted to assess lability of organic matter at those sites. Activities: We have been collecting monthly DOM samples from the Altamaha River and Sapelo Sound since Sept. 2015. Dark incubations spanning from 24 hours to 80 days are being conducted to assess how changes in river discharge/hydrology influence lability of organic matter at those sites over a year. Results: Data from the 4 GCE research cruises in 2014 were used to evaluate the export of terrigenous DOM in the South Atlantic Bight (Fig. 4). Activities: DOM samples collected from the Altamaha River and Sapelo Sound from Sep. 2015 to Sep. 2016 were analyzed using bulk (DOC), optics (CDOM) and molecular (FTICR MS; ultrahigh resolution mass spectrometry) techniques for the characterization of changes in composition due to river discharge and biodegradation. Results: Characterize DOM composition and predominant sources of estuarine water Initial results show that increased river discharge resulted in higher DOC concentrations and increased average molecular size and aromaticity (Fig. 4), indicating higher inputs of terrestrial DOM at both sampling locations. 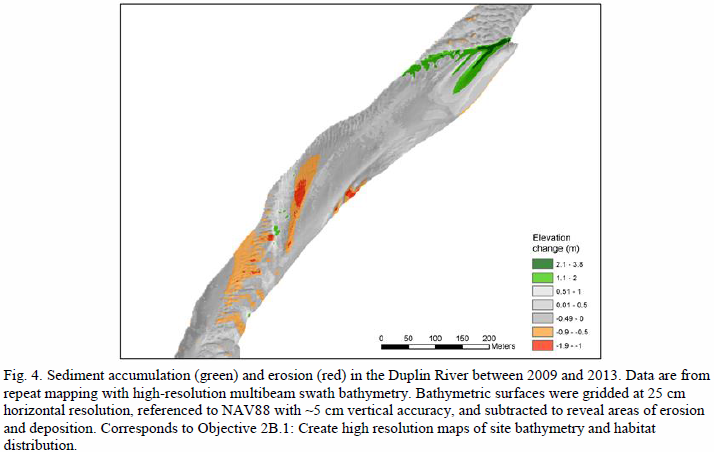 Activities: We conducted multibeam bathymetry mapping in the Duplin River during March 2013, allowing us to expand the mapped domain and compare with previous observations. Results: Analysis of data collected in 2009 and 2013 in the Duplin revealed areas that have gained or lost up to two meters of sediment (Fig. 4). The largest changes near the confluence of the main channel and Barn creek and the confluence of the Duplin and Doboy Sound. Hladik et al (2013) developed a method to overcome the respective limitations of LIDAR and hyperspectral imagery through the use of multisensor data. 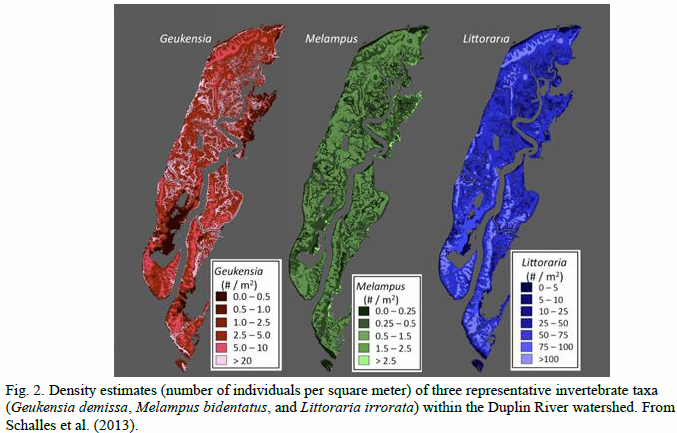 A decision tree that considered elevation ranges as well as normalized difference vegetation index in combination with hyperspectral information allowed us to produce both an accurate DEM as well as an improved habitat classification for the marshes on the Duplin River. Plans: Create high resolution maps of site bathymetry and habitat distribution. The Georgia coastal imagery consortium acquired high resolution aerial photography of the site in December 2012. These data will be available in December 2013. Activities: We collected high resolution imagery of a portion of the domain that can be compared with a Dec 2012 flyover by the Georgia coastal imagery consortium. We also conducted bathymetric surveys of tidal creeks to improve our DEM of the Duplin watershed. Results: Analysis of bathymetric and backscatter intensity data suggest differences in sediment type or variability in seafloor hardness along the Duplin. We are working to apply a computer automated bottom classification scheme to these observations, which will be presented at the 2014 American Geophysical Union meeting. Activities: We collected new high-resolution imagery of a portion of the domain that can be compared with Dec 2012 and 2013 flyovers by the Georgia coastal imagery consortium and the GCE. We also completed sampling the tidal creeks of the Duplin River with a high resolution echo sounder and have merged these data with swath multi beam and LIDAR data to provide a high resolution DEM for our modeling efforts. Results: Multibeam bathymetry data were analyzed for bedform asymmetry and elevation change. Bedform asymmetry indicates ebb dominated sediment transport from the river mouth up to a highly sinuous river channel reach where bed forms switch to flood dominated. Activities: A high resolution DEM of the GCE has been completed and is now in use in our modeling efforts. Activities: We are currently mapping the shallow bathymetry of Sapelo Sound with interferometric side scan sonar, which will provide improved bathymetric data for modeling efforts. We also continue regular high resolution aerial flights of the domain. Results: Create high resolution maps of site bathymetry and habitat distribution We are using aerial photography to map the location of wrack disturbance in the marsh. Although it is highly variable from year to year, there are some areas where it is found repeatedly because of prevailing winds. Activities: We have obtained ~ 300 Landsat 5 TM satellite images covering the GCE domain and selected images for analysis that cover every 2 months from May 1984 to Nov 2011. These are currently being orthorectified and atmospherically corrected in order to compare several vegetation indices (e.g. NDVI, SAVI, MSAVI 2) against plot-based estimates of plant biomass. Activities: We are using Landsat images to evaluate vegetation patterns. We developed filters for tidal stage and atmospheric conditions and a rigorous processing scheme, and now have ~ 500 images that cover the past 3 decades. Results: We are examining relationships between hydrologic and climatologic indices and various vegetation indices derived from LANDSAT imagery (NDVI, SAVI, MSAVI 2, etc.). We have documented strong correlations between Palmer Drought Index (3 and 6 month averages) and scene-averaged size classes of Spartina and Juncus (r2 values above 0.6). Activities: We used Landsat 5 TM images to evaluate patterns in S. alterniflora productivity over the last 3 decades. We developed filters for tidal stage and atmospheric conditions, and used an NDVI-based algorithm to extract information from a set of 294 images spanning 1984-2011. Results: An underlying annual phenological cycle of Spartina biomass was observed, along with substantial size class dependent, seasonal and inter-annual variations. Spartina biomass was correlated with river discharge, tide stage, and Palmer Drought Index. These results are consistent with, and extend back in time, similar analyses based on sampling permanent plots. Activities: We completed our analysis of S. alterniflora in the GCE domain over the last 3 decades based on Landsat 5 TM images spanning the entire length of the satellite's operation (1984­2011). Results: O'Donnell and Schalles (2016) found significant decreases in S. alterniflora biomass over time (Fig 5), which correlated with factors such as drought, temperature, and sea level. Activities: We developed the Tidal Marsh Inundation Index (TMII) which can be used with MODIS imagery as part of a remote sensing workflow to identify flooded pixels in tidal marshes. Results: Assess patterns of marsh productivity using satellite imagery O'Connell et al. (in press) applied the newly developed Tidal Marsh Inundation Index to marsh pixels on the Atlantic and Gulf coasts (including both GCE and PIE LTER sites), and found that preprocessing can improve estimation of vegetation phenology. 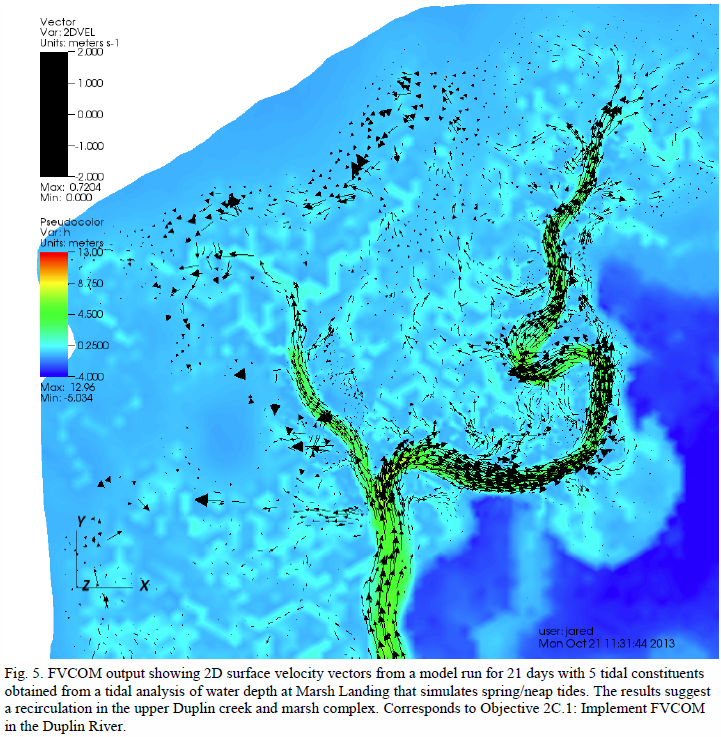 Activities: We have created a modeling mesh of the Duplin watershed, which ranges in resolution from 6 m in the small tidal creeks to 100 m at the open boundary in Doboy Sound, and conducted initial runs of FVCOM. Activities: The 3D hydrodynamic FVCOM model for the Duplin River watershed is currently running for 30 days with a 0.5 s time step, with tide, temperature and salinity forcing on the open boundary. Results: Groundwater discharge introduces freshwater into the upper section of the Duplin, resulting in a decrease in salinity of approximately 1 compared to model runs without groundwater (Results Fig. 4). This freshwater contributes to the net outflow of the Duplin. Activities: A high resolution, 3D, hydrodynamic model (FVCOM 3.2.2) is now running for the Duplin River. A Eulerian salt flux analysis was carried out to study advection and dispersion on transport processes and a Lagrangian particle tracking study was carried out to evaluate residence time under different conditions. Results: The model does well at predicting tidal oscillations and subtidal sea surface height and salinity variations. Residual flux dominates transport within the system and tidal flux dominates horizontal dispersion. Particle tracking analysis shows that residence time varies with tide, river flow, and sea surface height (Fig. 6). Activities: We have merged the Duplin DEM with LIDAR data for the coast, providing an integrated mesh with higher resolution around the Duplin River. We expect this to increase the robustness of the results in the Duplin River, since the dependence on open boundary conditions will be reduced. Activities: Initial runs of FVCOM suggest a recirculation in the upper Duplin creek and marsh complex (Fig 5). Activities: FVCOM has also been implemented in the GCE domain and is currently being validated using the salinity time series at multiple sondes collected as part of the LTER program. 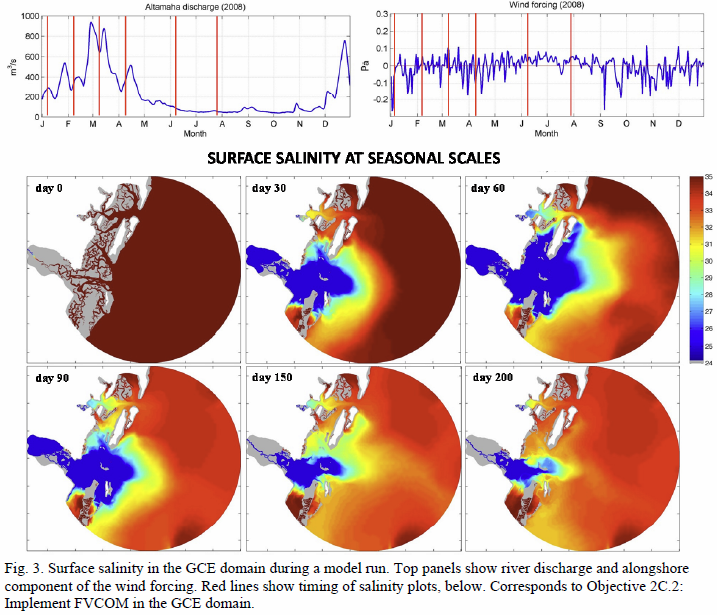 Results: Model runs for 2008 show the effects of river discharge and wind forcing on surface salinity over the course of the year, with lower salinities in the estuary during times of high discharge, which get transported either northward or southward depending on the wind (Fig 3). Activities: FVCOM has also been implemented in the GCE domain. The past year we completed an extensive validation using the LTER salinity time series and implemented computer codes to compute residence time and connectivity between the multiple channels in the estuarine complex. Results: Model runs from 2012-2014 capture the transition from a severe drought to a high discharge condition. We are currently investigating the estuarine response to this shift. Activities: FVCOM has also been implemented in the GCE domain and extensively validated against observations from GCE research cruises. Results: We used FVCOM to quantify residence time in the different parts of the GCE domain and found striking differences along salinity gradients and between sounds (Fig. 7). See Major Accomplishments. Activities: We have upgraded both the Duplin and domainlevel models to FVCOM4. We are now extending model simulations to 2016 and 2017. Carter, M., Viso, R.F., Peterson, R.N. and Hill, J. C. 2013. Poster: Tidal Pumping as a Driver of Groundwater Discharge to a Back Barrier Salt Marsh Ecosystem. Hydrologic Controls on Biogeochemical and Ecosystem Processes at the Land-Sea Interface III. 2013 AGU Fall Meeting, 9-13 December, 2013, San Francisco. Ledoux, J.G., Alexander, C.R. Jr. and Meile, C. 2013. Delineating the drivers of groundwater flow at a Back Barrier island – marsh Transect in coastal Georgia. In: Georgia Water Resources Conference, April 10-11, 2013 in Athens GA.
Hollibaugh, J.T., Liu, Q., Ross, M., Cheek, J., Sweeney, C., Tolar, B., Hagan, P., Whitby, H., Bratcher, A., Malagon, E., Lynn-Bell, N., Shalack, J., Reddy, C.M. and Walker, J.T. (in review). Coupling between Sediment and Water Column Populations of Ammonia Oxidizing Thaumarchaeota in a Salt Marsh Estuary. Peterson, R.N., Meile, C., Peterson, L., Carter, M. and Miklesh, D.M. 2019. Groundwater discharge dynamics into a salt marsh tidal river. Estuarine, Coastal and Shelf Science. Weston, N.B., Hollibaugh, J.T., Sandow, J.T. Jr. and Joye, S.B. 2003. Nutrients and dissolved organic matter in the Altamaha river and loading to the coastal zone. In: Hatcher, K.J. (editor). Proceedings of the 2003 Georgia Water Resources Conference. Institute of Ecology, University of Georgia, Athens, Georgia. Craft, C.B., Stahl, M. and Widney, S. 2017. Presentation: Tidal freshwater forests: sentinels for climate change. 10th International Workshop on Nutrient Cycling and Retention in Natural and Constructed Wetlands, September 21-24, Trebon, Czech Republic. Hollibaugh, J.T., Bratcher, A., Cheek, J., Liu, Q., Malagon, E., Popp, B.N., Ross, M., Schaefer, S.C., Sweeney, C., Tolar, B., van den Berg, C.M., Wallsgrove, N.J. and Whitby, H. 2017. Poster: LIGHT AND TEMPERATURE CONTROL THE SEASONAL DISTRIBUTION OF THAUMARCHAEOTA IN THE SOUTH ATLANTIC BIGHT. Fifth International Conference on Nitrification and Related Processes (ICoN5)23-27 July, 2017, 23-27 July, 2017, Vienna, Austria. Peterson, R.N., Meile, C., Carter, M., Peterson, L., Waldorf, A. and Miklesh, D.M. 2017. Poster: Groundwater inputs to a back-barrier salt marsh tidal river. 2017 Chemical Oceanography Gordon Research Conference, July 2017, Holderness, NH. Stahl, M., Widney, S. and Craft, C.B. 2017. Presentation: Tidal freshwater forests: a sentinel for climate change. SPEA Ph.D. Students' 17th Annual Conference, February 24, 2017, Bloomington, IN. Widney, S., Stahl, M. and Craft, C.B. 2017. Presentation: Tidal forests: sentinels for climate change. Society of Wetland Scientists Annual Meeting, June 8, 2017, San Juan, Puerto Rico. Alber, M., Schaefer, S.C., Pomeroy, L.R., Sheldon, J.E. and Joye, S.B. 2008. Presentation: Nitrogen inputs to the Altamaha River estuary (Georgia, USA): a historic analysis. American Society of Limnology and Oceanography, 3/08, Orlando, FL. Seay, J.E., Bishop, T.D. and Tilburg, C.E. 2006. Poster: Spatial and temporal variations of Porcelain Crab larval abundance in a Georgia Estuary. Southeastern Estuarine Research Society Fall 2006 Meeting, 19 October - 21 October 2006, Savannah, Georgia. Pennings, S.C. 2005. Presentation: Physical forcing and variation in salt marsh plant productivity at multiple time scales. Ecological Society of America 2005 Meeting - Ecology at multiple scales, August 7-12, 2005, Montreal, Canada. Shalack, J. and Bishop, T.D. 2004. Poster: Spatial and temporal variability in recruitment of decapod megalopae in the Duplin River, Georgia. Semiannual Meeting of the Southeastern Estuarine Research Society. Invertebrates - Poster Session. Southeastern Estuarine Research Society, 15-17 April 2004, Ft. Pierce, FL. Bishop, T.D. 2003. Presentation: Invasive biology and status of the green porcelain crab (Petrolisthes armatus) in Georgia waters. South Georgia Invasive Species Workshop, sponsored by The Nature Conservancy and Sapelo Island National Estuarine Research Reserve. October 2003, Brunswick, GA.
Bishop, T.D. and Hurley, D. 2003. Poster: The non-indigenous porcelain crab, Petrolisthes armatus: population trends in the Sapelo Island National Estuarine Research Reserve. 2003 Estuarine Research Federation meeting. September 2003, Seattle, WA. Bishop, T.D. and Hurley, D. 2003. Poster: The non-indigenous porcelain crab, Petrolisthes armatus: population trends in the Sapelo Island National Estuarine Research Reserve. National Estuarine Research Reserve System / National Estuarine Research Reserve Association Annual Meeting. October 2003, Charleston, S.C.
Bishop, T.D., Hurley, D. and Alber, M. 2003. Presentation: An inventory of the macroinvertebrate fauna of oyster reefs in the Duplin River, Georgia, with emphasis on non-indigenous species occurrence. 2003 Estuarine Research Federation meeting. Sept. 14-18, 2003, Seattle, WA. Ogburn, M.B., Bishop, T.D. and Alber, M. 2003. Poster: Population dynamics of two salt marsh snails in three Georgia estuaries. Southeastern Estuarine Research Society meeting. March 2003, Atlantic Beach, NC. Bishop, T.D., Alber, M. and Wiegert, R.G. 2001. Poster: Macrofaunal population shifts and changing coastal salinity regimes. ERF 2001: An Estuarine Odyssey. Estuarine Research Federation, Nov. 4-8, 2001, St. Pete Beach, Florida. Goodbody, G., Bishop, T.D. and Alber, M. 2001. Presentation: Distribution of snails in the Satilla and Altamaha River Estuaries. Southeastern Estuarine Research Society Meeting. Southeastern Estuarine Research Society, Mar 01, 2001, Charleston, South Carolina. Pennings, S.C., Bertness, M.D., Donnelly, J.P., Ewanchuk, P.J., Silliman, B.R. and Callaway, R.M. 2001. Presentation: Impacts of global change on coastal salt marshes. Keynote address to the German Limnological Association, September 17-21, 2001, Kiel, Germany.